Schedule of Cuban trains on Fahrplancenter (not updated since 2011) here. The only Caribbean island offering a full train schedule, Cuba can also be discovered through its rail network. In 2005, 32 million travellers used Cuban trains on 4,257 km of tracks, with 205 locomotives pulling some 734 passenger cars; in 2010, it has not improved, albeit some cars are now re-built in the renovated train yards near Caibarien. Surely, service is not what it surely could be, lack of modern equipment, good international financing (and stupid American embargo) being the obvious reasons. 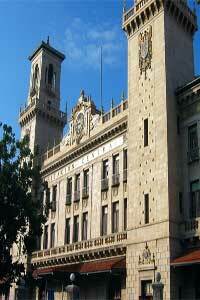 Video of train leaving Havana Central station; an obvious, American-made "announcer-voiced" travelogue : priceless. The poster does not mention his source. Here. 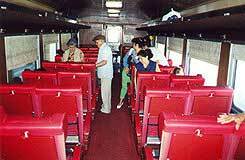 Motorized Canadian BUDD railcar (#29) runs daily to Matanzas, Santa Clara, Ciego de Avila and Moron. 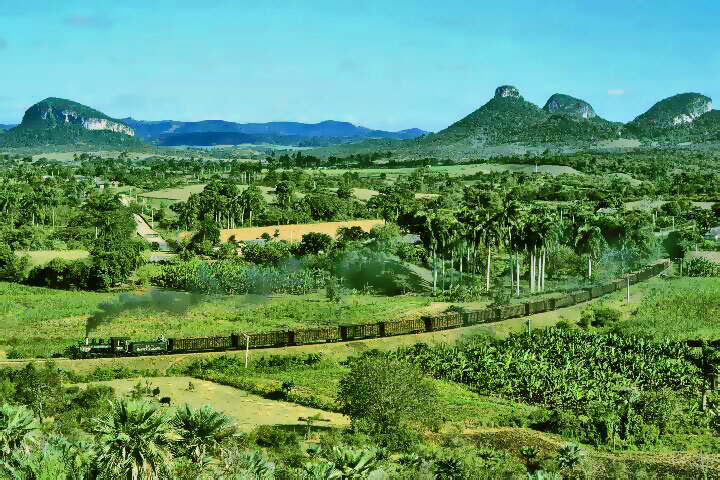 Cuban trains may be slower because the tracks have not been modernized but they offer tourists efficient if not luxurious service, at prices which are considerably more than what low-paid Cubans can afford. 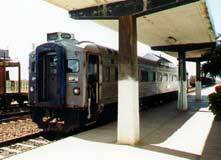 Best bet is service #29 to island center leaves Havana Central Station daily at 17h40 for Moron arriving at 01h55 via Matanzas (19h47), Santa Clara (21h08) and Ciego de Avila (00h12), Air-conditioned Railcar. Return leaves Moron at 23h50 arriving back in Havana at 08h00. Modified Canadian-made BUDD motorized wagons purchased in 1997 are quite fast (125 kph) but are more or less on time because some sections are taken at a slow pace. Reclining leather seats, shaky comfort. First-class service only (air-con, reserved seats, drinks). #29 (above right) which returns from Moron leaving at 23h50 arriving back in Havana at 08h00. Above photos © The Man in Seat Sixty-One by Mark Smith, traveller and train maniac. 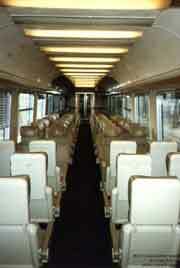 TEE cars made of aluminium are used by the Tren Francès Especial. The Tren Francès Espécial serves the trans-island, 835-km long route linking La Habana to Santiago with French SNCF cars, recycled from the famous Trans Europ Express [Paris - Brussels -Amsterdam]. 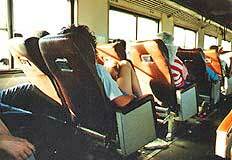 The Tren Francès Especial is exclusively an overnight service without sleeper cars (no Cuban train has sleepers). Only comfortable, cloth-covered seats with more than adequate air-conditioning, background music, cabin stewards and coffee-room section. Service #1 to Santiago runs on every third day. Service #2 to La Habana runs every third day. are taken from this site > this site. We have not yet used this service. 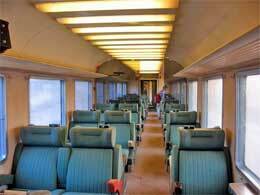 We can only imagine that the material sold to Cuba by the SNCF and used by Tren Francès Espécial looks like this. TEE First Class on Tren Francès Especial Class : two double rows, a central alley. in Especial Class, one way for one adult. in Primera Especial, one way for one adult. Half-price for children 7 yrs and less. 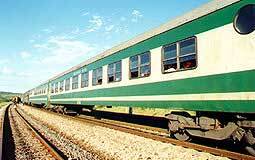 If you want to travel as real travellers do, bring your own food and drinks, reading material (your iPod) for long-distance services because, except for Tren Francès Especial, there are no dining or snack-bar cars aboard Cuban trains. You can be assured of meeting interesting people and experiencing some memorable moments ! 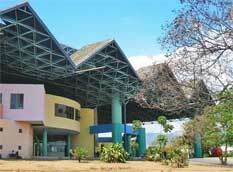 The new train station in Santiago. Steam trains, mostly used to transport sugar cane from fields to mills (photo here is a classic from 1996), are sadly enough rolling towards oblivion with the closing of the great majority of the 130 sugar mills (centrales) started in July 2002 and requiring the relocation and retraining of some 100,000 workers by Minaz, once the most important Cuban ministry. Effects of the closures on nature : slideshow here. Photo report from nostalgia buffs in 2003 : The Last Zafra (harvest) Here. 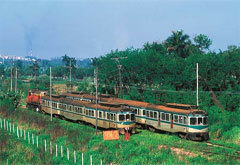 The only electric train in Cuba uses Brill electric cars. These are still rolling on tracks which leave from Havana's Casablanca station, going east towards Hershey and Matanzas. Casa Blanca is not really a station, more like a tramway stop. To find it, you have to go to the other side of Habana bay from the 4-minute ferry at the end of calle Santa Clara in Habana Vieja. Upon docking, turn left and look up to follow the overhead wires. First departure, 4h45 for those all-night party poopers. Last arrival, 23h18, for those early-to-bedders. Partially updated schedule on seat61 page. Using ingenuity and despite the 48 year-old US embargo, Cuban rail workers have kept these circa-1920's mini trains running. A 2006 video by Keesecito here on you tube; here. The 95 kilometers of tracks were built by US chocolate magnate Milton Hershey. Ed Ewing wrote about his Hershey ride in the Guardian, February 2008. Link here. There are also six daily departures from La Coubre station for Hershey. A 50-minute ride. To let a steam locomotive die is to let history die. there is talk of eventually reviving, supposing the US embargo ever disappears, the old carfloats between Florida and the north coast of Cuba. 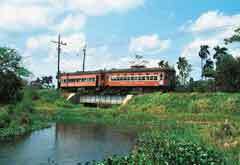 Before the Revolucion, this was a very popular service as US citizens could visit their colony, the "Pearl of the Caribbean" using a car-on-train service, to and from Cuban seaports in La Habana, Mariel, Puerto Padre, Nuevitas, Cardenas and Isabela de Sagua. Dreamers in Florida think (at least, they did so in 1999) they could revive the bi-modal Isabela de Sagua port, the shortest run between Cuba and the USA. Located some 350 km east of La Habana and 65 km north of Santa Clara, it would link in Florida, to Palm Beach. 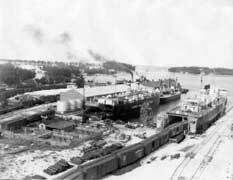 In 1948, rail cars laden with automobiles penetrate a ship bound for Cuba : the famous old carfloat.